Woody Finally Speaks to a Dying Andy | Words. On the Internet. Woody took a deep breath and exhaled slowly. He’d been imagining this moment for the past eighty years, dreading the day he hoped would never come. Of course he knew it would, it was unavoidable. Time only stood still for him. Yet no matter how many times he lied to himself, he knew it was going to happen. Now all he could now do was accept what he’d tried to avoid. He wasn’t sure what exactly he was going to do or say, all he knew was that it was absolutely forbidden. “Do not speak, do not be seen.” He’d followed the rule since his creation, watched silently as his friends were tossed away, as Andy himself carried him off into the darkness. He’d let dozens of the others vanish from his life without so much as a peep, the empty stare of their plastic eyes constantly flashing back to life every night he slept. He’d tried to move on, tried to pretend that it was just the way life worked, but he remembered each and every one one. Jessie, Rex, Hamm, and even Buzz—he had been the hardest, sold at a sale to a young boy while Woody had been spared. No matter who, though, he regretted each time he silently watched them disappear. This one, however, he’d not let go quietly. He no longer cared about tradition; he refused to stay home while they carted him away. “Hi, Andy,” Woody said, climbing out of the red duffle bag lying on the stand beside Andy’s bed. Andy opened his eyes, the wrinkles around his skin widening slightly as he blinked. He glanced around the room, the bone white bed sheets pulled up to just below his chin, before closing his eyes again. Some sort of strange machine beeped steadily beside him, a single green line running up and down its screen like a mountain range. Woody pulled himself the rest of the way out of the bag and jumped down to onto oak nightstand with a soft tap. He stood for a moment, staring at the unfamiliar man beside him, silently reminding himself that it was Andy, that it was the person he’d known for so long. He took a few steps toward the side of the bed. “Andy,” he whispered, staring directly at the side of his tired face. He looked nothing like the boy he’d grown to love, nor the young adult he’d been the last time Woody had seen him. That was almost sixty years ago, with each day since crawling slowly by. Sure, Andy occasionally climbed up into the attic, searching for something that was never his old, trusted toy, but Woody could never see him. He’d been stored in a dark corner of the attic, and that was where he had to stay each and every time Andy visited. “Do not speak, do not be seen.” The moment the creak of footsteps echoed through the otherwise silent attic, he’d rush back into the box and recreate the uncomfortable position he’d been left in. Andy opened his eyes again, peering around the room until finally noticing Woody. “Woody?” Andy whispered, leaning up on his elbows, the white hospital gown wrapping tightly around his chest. He glanced around the room again, as if looking for someone, his breathing slow and labored. 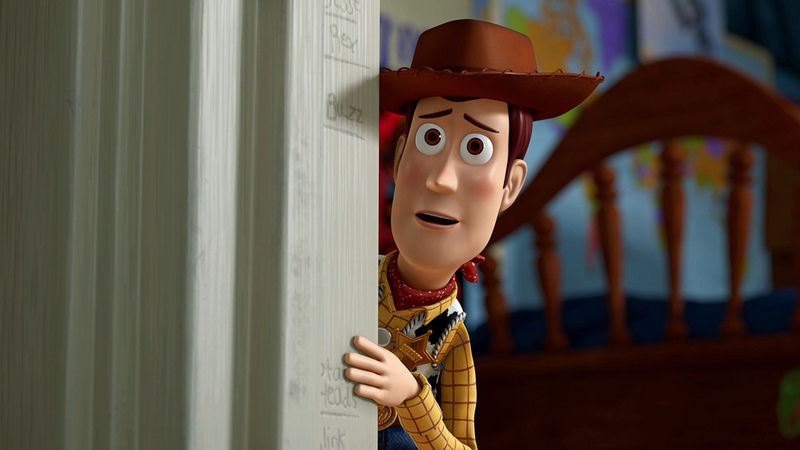 “Hi, Andy,” Woody said, his voice cracking slightly. He removed his brown, plastic cowboy hat and placed it over his chest. Andy stared at Woody, his eyes growing wide. “It’s been a while,” he continued, taking a step forward and placing his hat back on his head. He’d been imaging this moment for so long, playing out each and every possible outcome since the first time Andy had picked him up. “What’s going on here?” Andy said, his voice tired and slow, a slight rasp to his words. “How are you talking?” His head was almost bald now, brown liver spots surrounding the skin on his scalp. Wrinkles crossed each and every way over his face, like the lines on the map Woody had guiltily read again and again in the darkness of the attic. Still, he could make out the familiar face of the boy he’d known so many years ago, the same eyes he’d stared into while they played on the bedroom floor. Andy opened his mouth slightly, then closed it. “What do you mean?” Andy said, pushing himself up further. The beeping machine beside his bed increased its pace slightly. Andy nodded slowly, his mouth slightly ajar. Andy stared at Woody, his eyes growing slightly red as his lips pursed together. The machine began beeping even quicker. “Woody,” Andy said, his eyes still wide, the crimson around his iris’ giving way to a tear. He stared for another moment, his mouth partially open, before lowering himself back down onto the pillow, his head remaining sideways, eyes still locked on Woody. The mountain range on the screen behind grew steeper and steeper with each hastened beep, before finally sloping to a smooth, flat plain. “It’s all right,” Woody smiled, leaning over and placing his plastic hand on the tip of Andy’s finger. Aw, so sad! But you brought up an interesting and valid point. What happens to the toys when their kids grow old and die? Really good. I’m going to share it on my blog next month and let you know the exact date. Great job!